Hi guys, at present time there are billion of smartphone users. These users must have to use latest technology smartphone. These smartphones are developed by different mobile manufacturing companies which comes with latest features.Today we discuss Guide for buying best smartphone. When anybody looking a new smartphone for buying, they must have to read different reviews, specification, compare with other smartphone, read buying tips for best smartphone. All these things are much important for any person. Before invest your money in these electronic gadgets you must have to know all things. In this article we suggest you few important tips before buying new smartphone. Most of the person make hurry to buying the new smartphone. They invest lot of money but after sometime they will be frustrated due to many reasons. Before buying any smartphone you must know few things. This article helps for you to choosing right smartphone. 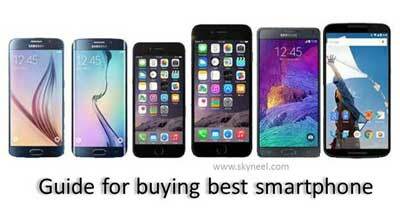 So, read these important guide for buying best smartphone. This guide will give best experience for all those new users who want to buy new smartphone. Before buying new smartphone you must have to check processing speed like capacity of processor, RAM and other things. If you will get better processing specification you must choose few smartphone and then compare each other. After they you will be able to get right decision which smartphone provides you fast processing speed. Sometime few people’s check the stylish look and costly smartphone but they not check processing capacity of the smartphone. After spending some time they fell that they make a big mistake for choosing right smartphone. If you get much better processing speed than others then doesn’t mean of stylish look and costly smartphone. If you want to buying new smartphone and somebody told you buy any old technology smartphone. Then you will be disagree with him due to the main reason each and everyone want to buy latest technology smartphone. Old technology smartphone not provide better features and speed then latest technology smartphone. You should keep one thing in your mind, there is not important to buy latest features smartphone. There is no more role of latest features or specification. First you should check do you get regular updates or how many updates are released by the company. If any mobile manufacturing companies provide you regular updates then you should choose that type of smartphone. Due to the receive regular updates your smartphone always have latest features and get longer life then other smartphone. Few person also check different forums and websites in which lot of person give’s his review about the smartphone. There is a big communities in which you will ask about your query and you will get different suggestion from the members of the forums. These decision will helps you to take right decision and provide important tips before buying new smartphone. This is one of the main thing which we will face. Most of the Android smartphone battery life reduced within a day, while normal phone running 2-3 days within a single charging. Each mobile manufacturing companies provide the detail of his battery life. How much battery is consumed during playing audio, video, 2G, 3G or 4G networks, playing games and many more. Most of the person like to use different types of apps they also running in background and consumed lot of battery. Most the person like to read android smartphone battery saving tips or use quick charging technique. If you want to quick recharge your phone battery, i suggest you to buy Qualcomm’s Quick Charge 2.0 standard. Qualcomm Quick Charge 2.0 is the next generation which provide the facility to quick charging of your smartphone battery. This device is powered by the Qualcomm Snapdragon processor, which charge up to 75% faster than normal charger. The Qualcomm Quick Charge 2.0 is a certified power adapter. You can’t get these quick charging speed with any other adapter. There is another way to quick charge your smartphone battery with the help of powerbank. There are lot of companies provide different capacity powerbank which is able to quick recharge your smartphone battery. These powerbank specially useful when you don’t have properly power supply or during the travelling. In that situation if your smartphone battery is not more then you can use these powerbank to quick recharge the battery. I hope you like this article. After reading this article you will be able to know Guide for buying best smartphone. These important tips are useful to invest your money for choosing right smartphone. Kindly share your knowledge with your friends, family members and others. Thanks to all.